While these measures may seem draconian at first glance, it’s kinda just like – how the rest of us live. We contribute to our own retirement, pay monthly toward health care costs, and get raises roughly in line with inflation (or at least market demands). Employers only pay their employees enough to retain them. Public sector unions rarely have trouble with retention – because it’s such a sweet gig! I always hear this stuff about how teachers need more money and need union protection, etc. What a joke! My wife became a teacher because she knew she’d love teaching – and found the union issues to be utterly ridiculous. The bottom line is that without these changes, there will be thousands of layoffs and the costs and obligations will come home to roost again in the future. It’s kick the can down the road or deal with it now. By not showing up to work and demanding above-market pay, above-market benefits and basically extorting the public in a concerted fashion, they’re not doing themselves any favors. The big question is when will other states follow suit. 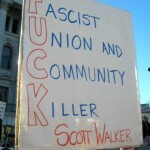 Wisconsin’s taking a page out of Chris Christie’s book – (see where he takes on union extortion). I usually defend teachers against some of the more common and inaccurate forms of criticism, but walking out like this isn’t about the kids. It’s extortion plain and simple. Thousands of kids missed class; thousands of parents had to make emergency plans for their children and these teachers work for the public which they seem to have forgotten. Any Cheeseheads Out There? What’s It Like Out There This Week? MR, another good post to remind the rest of us plebes of the gutlessness and self-interest of craven politicians, be they of the city, state or federal species. I hope they were found under whichever rock they were hiding under. Hey 101, call me Darwin! LOL – last few comments are for Money Reasons I presume. anyway, appreciate the drive-by. Lots of promises were made over decades to curry favor with Unions for votes. Clearly unsustainable. People seem shocked. They are naive. With all due respect to your wife and other teachers, I think teachers are more apt than any other professional to become disconnected with reality. Consider this: they go to school, go to another school, one more school, then go back to work…in a school. Mmm, I don’t have any sympathy for the teachers at all here – as you’d see in the Chris Christie hero post I linked to as well. At the same time, I don’t think teachers are any different than the rest of us from a social/sheltered standpoint. Couldn’t the same be said of computer programmers that work 12 hours a day toiling away on a computer who then come home to play games? Aren’t they disconnected from reality? Or a cop who deals with ingrates and criminals all day and then has to come home to his family? I think such stereotypes could apply to virtually any profession. Personally, my wife started her career with a bunch of very cool, fun, enthusiastic college grads and she’s still friends with many of them. Some, like my wife, are stay at home moms now, while others work. The young generation pretty much mocks the union BS. It’s primarily the stodgy old lifers that want to milk every last dollar out of the taxpayer for their pension and retirement. If you ask me, all public employees unions must be banned. There is an inherent conflict of interest when union employee salaries are determined by politicians — who are supposed to be representing *all* taxpayers (not just union members). In the end, it is basically a racket where one party promises to raise the salaries and perks of the public union employees in exchange for votes and election contributions. In essence, taxpayer money is then used to get those same politicians reelected; it’s a vicious cycle that must be broken soon. Hopefully, the rest of America has finally seen the light and what we are now witnessing is the beginning of the end of the gravy train for these public unions. Hahaha The issue isnt about paying more for health care. They have all agreed to do it. They just want their rights to collectively bargain back. The provision to strip the ability to collect dues automatically is an attempt to de-fund unions in a roundabout way. And you claim they should be treated just like you? Hmm… since when were your raises limited BY LAW to the rate of inflation? If you perform well at YOUR job, I bet you are able to get a raise above the inflation rate without having to pass a referendum. Actually, at the time of this writing, they had not agreed to the concessions they did regarding payments and raises. It was only later in the week with Dems on the run that they realized they had to make concessions. There’s still no good reason the public sector should have unions. It’s so corrupt. The public has to pay for this symbiotic relationship between democrats and unions – on the public dime! And me? My raises are based on what’s going on in the market. If my employer doesn’t fear losing their top employees, they keep raises as low as possible to optimize profits while high enough to retain them. Why should teachers and other unions be any different? What’s wrong with a teacher proving themselves in the classroom so the district is enticed to pay them handsomely to retain them? Nah – that would be merit-based. They don’t like that. Every industry has a good reason to have a union. Unions lift the middle class. They set a standard for wages and benefits, if another non-union company wants to compete in the labor pool and attract higher quality workers, it will pay in line with the unionized company. Its the same with teachers, nurses, etc. Now, why would some of these people stay in the public sector? Why wouldnt they go to the private sector where they make more money? 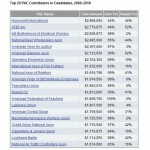 And please dont try claiming that they are paid more than the private sector. Thats outrageous. A nurse in my family took a $6/hr paycut to work in the public sector, solely because of the retirement benefits and her coming retirement. Look, Im all for paying based on a merit system, but then why wasnt that written in the bill? The fact is that even if YOUR company wasnt doing so hot, and YOU didnt get the raise you wanted, you can go somewhere else. 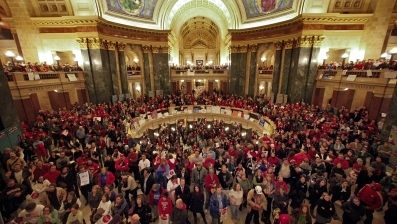 Where does a teacher go if Walker gets to decide their salary all over the state? Thats right, they go out of state! Taking their talents with them. Where does a nurse go? Back to the private sector. You see where im going im sure… Lastly, you claim that its YOUR tax dollars that are going to unions and dems. Really? Does that mean if YOUR business gets a government contract and you get paid from it, that MY tax dollars are paying for you live? No, it means you EARNED that money and you can spend it however you want. Everything you’ve just cited is basically artificially inflating the market comp rate. Do you really think that’s sustainable to compete in the world? People are scratching their heads wondering why America is losing its luster in the world. The answer is right in front of us. If a tradesman is worth $12 an hour in the market, he should be paid $12. Not $16 with a full pension, zero health-car contributions, the ability to call out sick whenever he wants, lie about his FMLA status, claim he’s on a Death in Family while he’s in the Caribbean on vacation and then when he gets caught, use a union grievance procedure to force an arbitration, where the arbitrators intentionally “give” some to the company and some to the union so they keep getting work (since arbitrators are mutually agreed by both parties). Seriously, if you were a business owner, you’d want to run a business this way? The whole system is a complete farce. Those “in” the union make out like bandits. Everyone else pays. And no, I didn’t fabricate that example. The whole point of a union negotiating with a business is to determine the value of the employee. The union doesnt decide. They negotiate. We can agree on one thing. I do believe the modern union needs to be modernized. A business needs to find a way to have a little more flexibility with who it hires and fires, and the workers need to maintain a healthy wage and benefit package. Im not so much a fan of the size of unions either. I think it would make more sense for each business to have its own employee union that works closely with management and board/owners to settle on fair compensation, keeping dues to a minimum and eliminating the unions contributions to politics, but also eliminating the rights of corporations and business to do the same. But without these changes, I still have to side with the union because they have the interests of the middle class in mind, while a business is solely profit driven. On top of that, NAFTA, CAFTA, etc and free trade in general have created an uneven playing field in a global market. Its impossible to compete with slave like conditions in other countries, and no American should be forced to compete with that. Thats a race to the bottom, and one that I dont intend on running.